Published by Lawyers and Judges Publishing Company in 2013, Colorado DUI Defense: The Law And Practice is a necessary resource for any attorney practicing DUI defense in the state of Colorado. Members of the National College for DUI Defense, authors Jay Tiftickjian and James Nesci are known for their ability to fight successfully on behalf of their DUI clients. With multiple publications to his credit, attorney Jay Tiftickjian also has a proven ability to convey even the most complex legal information in a way that is accessible to the reader. Here in the this book you will find the information and guidance you need to successfully practice DUI defense in Colorado, and get the results you want most for your clients. There has never been a more difficult time to mount a successful DUI defense, something you have probably recognized if you have been practicing for very long. With often draconian DUI laws to deal with, and public perception that is less forgiving than ever for your clients, it can feel like the odds are stacked against you before you every speak with a client. As you move through the process of building your case, you need every resource at your disposal to achieve a favorable outcome. As practicing attorneys the authors of Colorado DUI Defense: The Law and Practice understand that it is not enough to have a book filled with information – you need to know how to use that information when it counts. Included with the book is a bonus DVD where you will find many practical tools and applications designed to streamline and simplify the complex DUI defense process – tools and applications developed by the authors to help you get the most out of your investment. All bonuses are easy to locate, review and print out from the DVD. Along with tools and applications, the DVD also includes NHTSA studies, articles and visual detection videos. You may be new to practicing DUI law. Perhaps you are new to practicing DUI defense in Colorado. Or maybe you have been practicing in Colorado for some time now, and you want to improve your abilities to better serve your clients. Whatever your background or situation, Colorado DUI Defense: The Law and Practice, can help you improve as an attorney and get the best possible outcome for your clients. Attorney Jay Tiftickjian is considered a top performer among Colorado criminal defense and DUI defense attorneys in Colorado. Named “Barrister’s Best DUI Lawyer” and voted “People’s Choice: Best DUI Lawyer” repeatedly by Colorado’s official bar journal, he and attorney James Nesci are dedicated to assisting their fellow criminal defense attorneys. You will not find a resource written by a more well-qualified attorney to help you in your work. 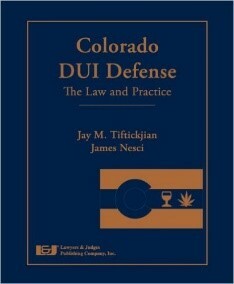 Colorado DUI Defense, The Law and Practice, 1st Edition, 2013 is available at Amazon and Barnes & Noble.